It takes a large and active community to create the MayDay Parade and Festival. Every April, In the Heart of the Beast opens its doors to our community for a month of free workshops during which the MayDay parade -- floats, masks, puppets, and costumes -- is built. People of all ages and walks of life work together to create one of the most beloved events in the Twin Cities. The financial and in-kind sponsorships of businesses and foundations help us make this community endeavor possible, keeping the workshops free and open to all. 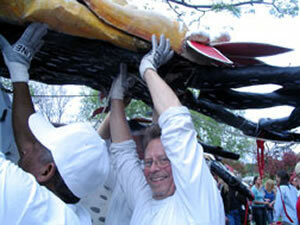 The MayDay Parade & Festival is presented in cooperation with the Minneapolis Park & Recreation Board. Special thanks to Liz Kraus, Powderhorn Park Director, and the staff of Powderhorn Park. And special thanks to the hundreds of individuals, foundations, and corporations who have contributed to this and other programs at In the Heart of the Beast Puppet and Mask Theatre.